One of the blogs I subscribe to comes from Carl Richards and his Behavior Gap. A recent one struck me – it concerned a study, “Buying time promotes happiness,” authored by Ashley V. Whillans, Elizabeth W. Dunn, Paul Smeets, Rene Bekkers, and Michael I. Norton. It was reported in the Proceedings of the National Academy of Arts and Sciences in July of 2017. The study concerned the correlation of rising wealth with an increase in the sense of time scarcity. The researchers surveyed ~4,500 people from around the world in its first round, and 1,800 in its second round. The question was whether, and how much, individuals “outsource” various life-maintenance tasks, and how that affects the level of satisfaction they feel in their lives. The first round limited the outsourcing to such things as cooking, shopping, cleaning, transportation. The second broadened the outsourcing possibilities and asked for additional information on income and spending habits of each household. The conclusion the study came to was that, yes, people who outsource less-favored tasks demonstrated greater satisfaction with their lives. Mr. Richards found himself in agreement. It seems intuitive and sensible. Wouldn’t we all like to hire someone to take mopping the floor off our plates? And many of us do this, and find it does, indeed, make our lives easier and more satisfactory. But is that the whole picture? Mr. Richards shows another side, when he shares that the reaction he got from communicating the study’s findings was – anger. It turns out an attorney earning $300 per hour, who changes the oil in his car himself, responded by asking if everything we do in life has to be based on dollars and cents. Another successful individual prefers to bake his own bread, and gets great gratification from doing so. The consensus was that the research was missing an important factor – the satisfaction one derives from performing a task well one’s self. Contemplative solitude may also be a factor – baking bread from scratch takes a while, and isn’t a spectator sport. Neither is changing your oil. Speaking from my own experience, I understand both takes on this. My wife and I have a regular housekeeper, our gardening is hired out, we eat out often. And it’s great for us. On the other hand, around last Thanksgiving I wrote about my experience of having my regular shoeshine guy being unavailable for some time. I ended up shining my shoes myself; it reminded me of my father, who taught me how to shine my own shoes. I focused on the task, did a good job, and felt a swell of pride. I would have missed out on that if I had waited for my guy, or gone and found another shoeshine person. So, it’s probably a juggling act – outsource some things, but maybe not everything and definitely do the things that bring you enjoyment, gratification and contentment. 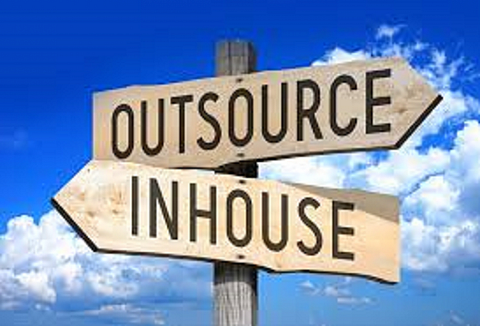 What do you outsource? What tasks to you keep for yourself? Please click here to email me directly – I would love to know what works for you.